Apparently, it is for the major newspapers in Oklahoma. 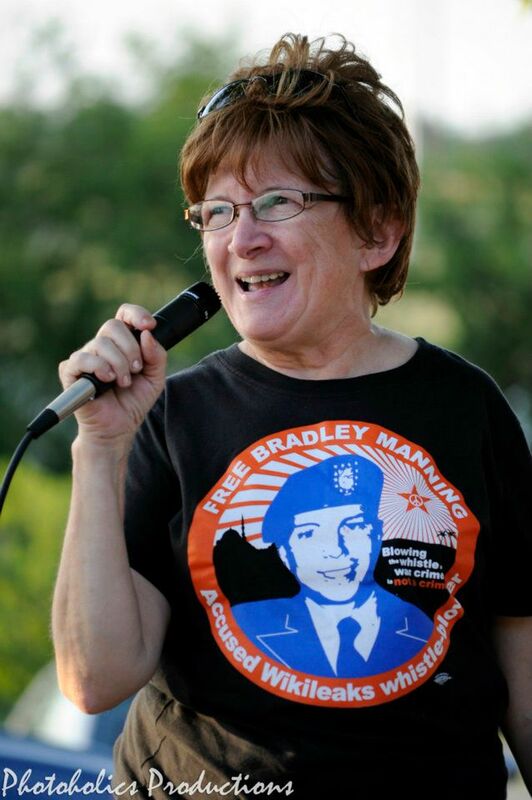 On Tuesday, March 18, a front page story in the Daily Oklahoman by Anne Kelley, “Marine won’t draw penalty for flag fight”, contained an unbelievable slander against antiwar activists in Oklahoma and across the country. MIDWEST CITY — A U.S. Marine Corps reservist may have broken the law when he crossed a protest line to defend the U.S. flag, but he will not be punished for it, city officials said. Midwest City Assistant City Attorney Randal Homburg said he thinks there are grounds to prosecute Ray Adam Modisette, 20, for an act of civil disobedience. At the request of the local police department, Homburg said he’s declining to file charges. Modisette, of Shawnee, was arrested Friday afternoon on a complaint of interfering with official police process. He told The Oklahoman he was reacting to a war protester who was stuffing an American flag down her pants. MIDWEST CITY — A U.S. Marine Corps reservist won’t be charged for ignoring police requests and wading into a protest to rescue an American Flag. Ray Adam Modisette, 20, said he was reacting to a war protester who was stuffing an American flag down her pants. . .
Then radical rightwing bloggers picked up the theme and ran with it. Hey, publishing monopolists, nice addition to our state image around the world, on the heels of the Sally Kern affair! Way to go Oklahoma and World! But even more important, a letter to the editor written and sent on March 20 by Oklahoma city peace worker Rachel Green has not been printed by the Oklahoman. So they won’t even allow us to publicly express our concern about being slandered! I myself called the paper on March 20, and was basically blown off. 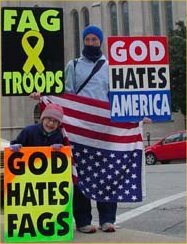 They simply didn’t see anything wrong with conflating peaceful protesters of the Iraq War with angry, bigoted, unhinged antigay activists who target the military, even the funerals of dead soldiers, because they think God is punishing America for homosexuality. I’m not familiar with the World, so I’m focusing my outrage at the Oklahoman, which refuses to cover our local antwar events, doesn’t publish our letters, and instead operates a spin machine in this state that keeps its readers, and the wider population of the state, uninformed at best and misinformed much of the time. Now, I lived in the Waco, Texas area for a year, and despite that being a less diverse and more conservative community generally, the local daily treated the peace community fairly in comparison to OKC, and even before Cindy Sheehan arrived in nearby Crawford, printed stories and photos about antiwar activities. The treatment we have been used to and tolerated here is unacceptable and I say it’s time to do something about it. 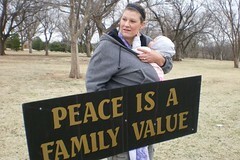 I think we Oklahoma peace activists should call a meeting to discuss how to address it. I am ready for whatever we agree to do in response: petitions, letter drives, pickets, boycotts. It is time for this nonsense to end. I’m not willing to continue to bear this outrage in silence that amounts to acquiescence. If we don’t fight back against this, what good is all our work for justice? Let’s stick up for ourselves, finally!